Did you guys watch Grease Live last night? I did, and I loved it so much that I decided to give myself a Grease-themed mani to prove it. 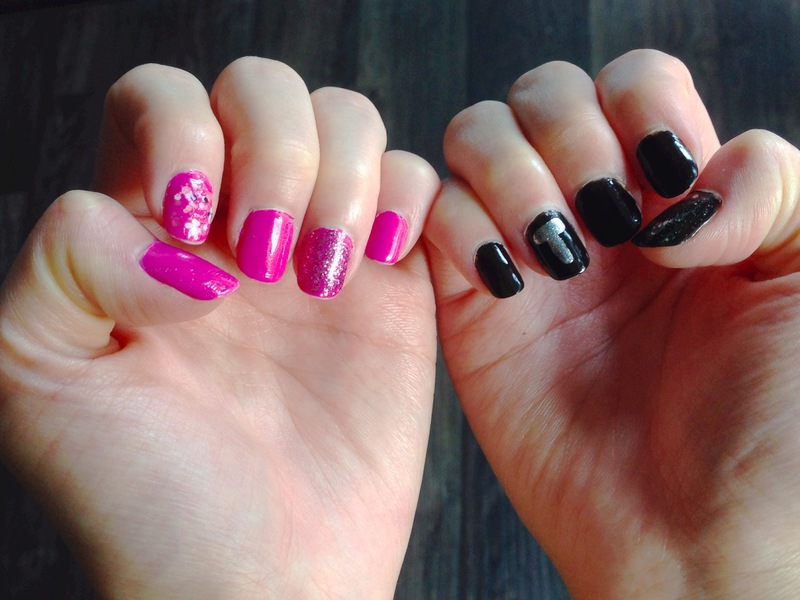 I painted one hand pink for the Pink Ladies and the other hand black for the T-birds. I accidentally made my left hand pink, so I had to try and write the “T” with my left hand. That’s why it doesn’t look good (or as the T-birds would say, “cool”). For my Pink Ladies hand I used these colors from above picture from left to right: Claire’s Paparazzi (Pink, white, and black sequin top coat on index finger), Wet n Wild Sparked (pink and silver glitter coat on ring finger), and OPI Techno Girl (pink base coat). 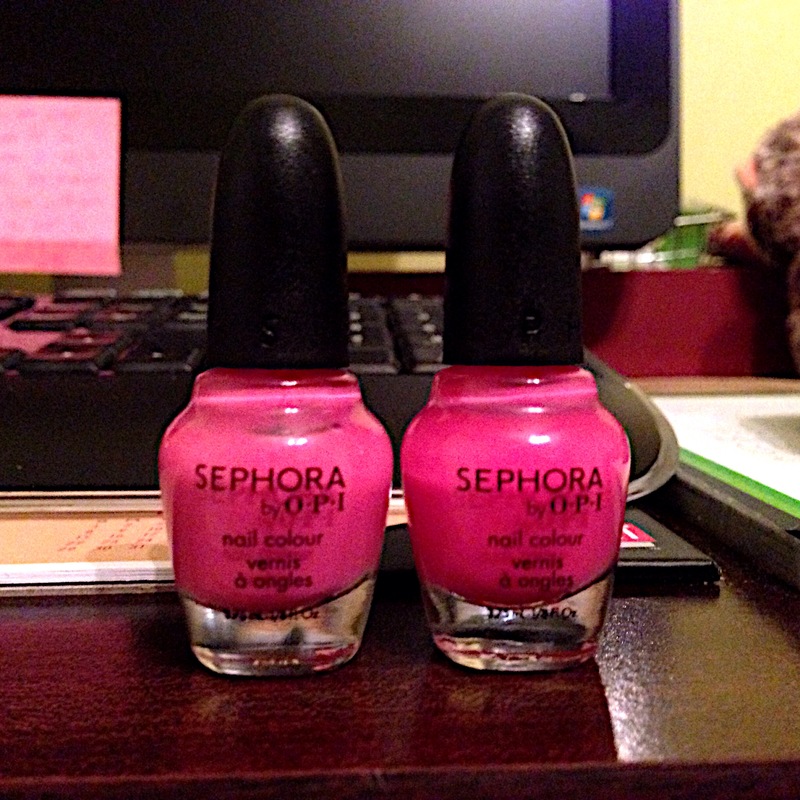 For my T-birds hand I used these colors from above picture from left to right: Sephora by OPI Are You Glistenin’? (silver glitter coat on thumb), Sally Hansen Black Out (black creme base), and Zoya Trixie (“T” on ring finger). I just now realized that used both of these silver colors in my last week’s Mani Monday. When I heard that Fox was going to do a live musical, I was excited because I am a big musical junkie. However, when I heard that they were going to do Grease, I assumed that they chose Grease because they could make simple sets and costumes. That assumption was incorrect. This show was extremely complicated. It was production coordinating genius. The way the scenes went from outside to inside must have been a nightmare to organize. The people at Fox really went all out. I didn’t like that they kept showing us the behind-the-scenes secrets because I felt like it took the audience out of the realm of the show. I wish they had shown all of that in a re-airing of the show or a separate after show. Yet I know how difficult this must have been for the cast and crew and understand why they wanted to show off a little. Also, Julianne Hough looked so much like Sandy that it was almost scary. The only reason it wasn’t scary was because she looked so cute and innocent. Did you watch Grease Live last night? What did you think? Let me know in the comments! 50 Sheet Masks! (Minus the two that we used today and plus four from Etude House, so really 52 sheet masks!) My sheet mask collection makes me feel like the Uncle Scrooge of beauty. The sheet masks that we tried today are from a brand called Leaders Insolution. This is my first time trying this brand. I thought I read all the ingredients in the listing, but I missed the Witch Hazel Water. Normally, I wouldn’t mind an astringent in my mask, especially at so small a percentage. However, my skin still hasn’t recovered from my dry Arizona Thanksgiving trip since I have been sick so many times since. It stung a little bit after the initial application, but I’m sure my normally oily skin would’ve benefited from the Hamamelis Virginiana. Otherwise, I liked this sheet mask. My skin feels softer and more moisturized now. I hope this review doesn’t scare you from using sheet masks. They are amazing. Let me tell you why. First of all, sheet masks are a total game changer. If you are not using them, then you are missing out on soft and glowing skin. They make me look human even though I have been sick for what feels like two decades. Second, they are really fun to put on with your husband. I have no photographic proof of this sorry. Third, they are really relaxing. Do you use sheet masks? If so, which ones are your favorites? Let me know in the comments so I can go buy them! If you have read my blog before, then you know that I am glitter obsessed. I am sorry to show you a polish that is discontinued, but I had to wear it because it is pretty much a New Year’s party in a bottle. This is Soho Street by Nails Inc. I’ve never been to Soho (London), but I now have larger than life expectations of it due to this color. Soho street is not a full coverage glitter polish. However, if I did a couple more coats (shown above is two coats), it might get there. 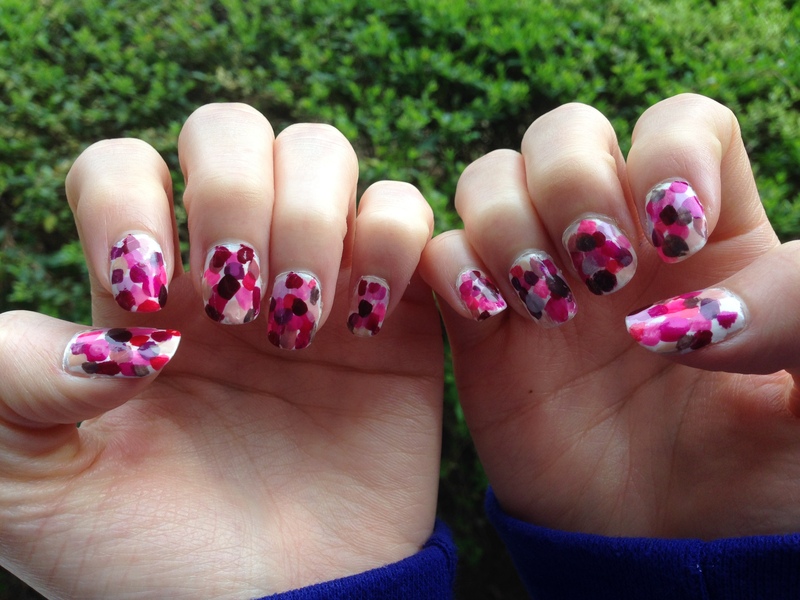 In honor of the lovely spring weather we have been enjoying, I give you my own interpretation of blooming flowers. I was going to actually paint flowers on my nails but did not like the stark contrast of the white nail polish I had painted as the background color. 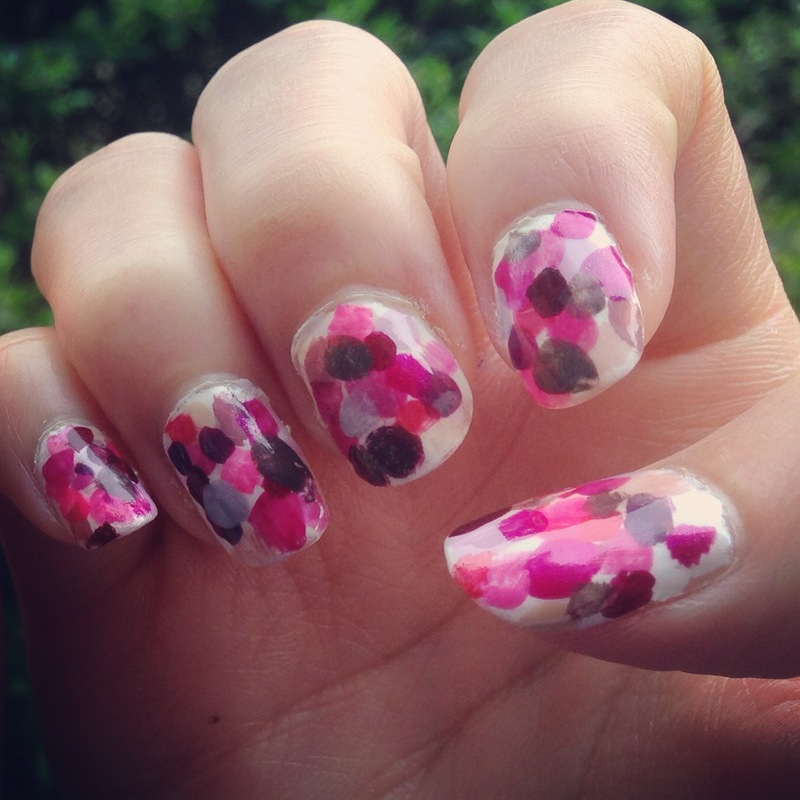 I randomly decided to dot different hues of pinks, purples, and nudes on my nails and found that I enjoyed the results. 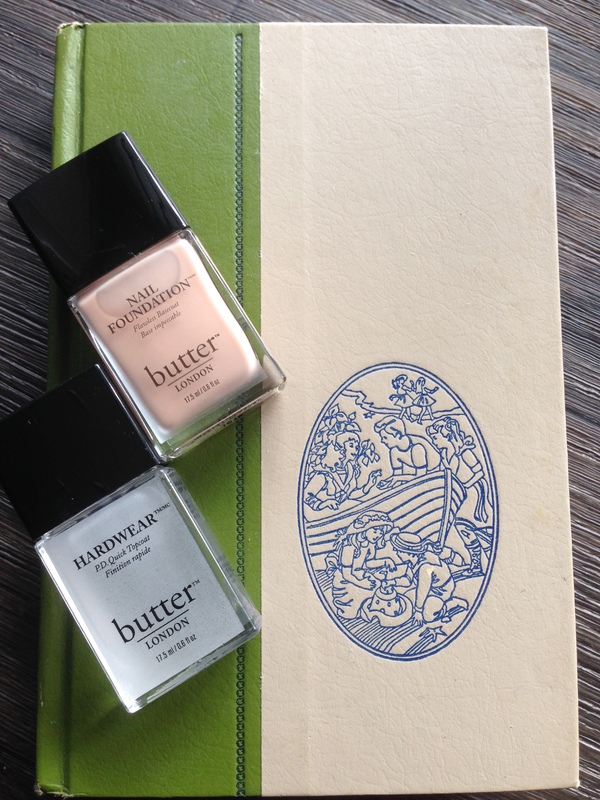 I have really been loving my new Butter London basecoat and topcoat. I believe I did these nails on Thursday, and I only have one chipped nail today. 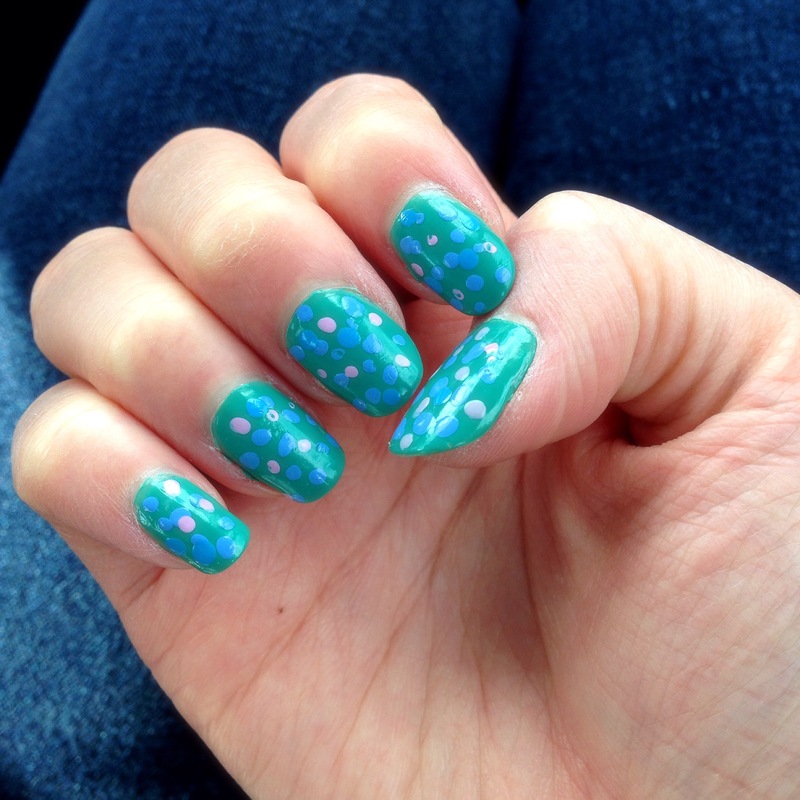 Usually, I would redo all of my nails when I get a bad chip, but this mani is easily fixable. I added more colors to the chipped nail, and now no one will be the wiser. It is important to look my best tonight because we are going to a film screening, and I am hoping to meet the funny star. I’ll update you about it tomorrow. 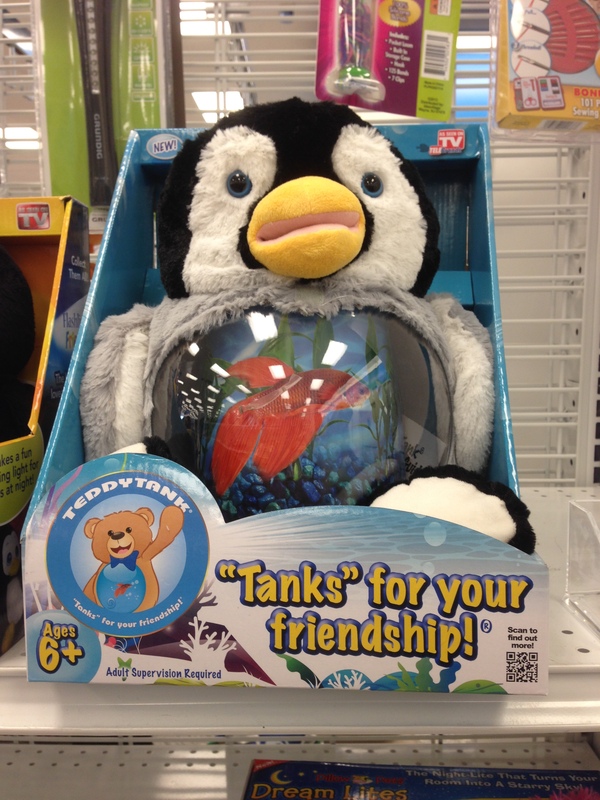 For now, I’ll leave you with this disturbing stuffed animal/goldfish bowl combo. 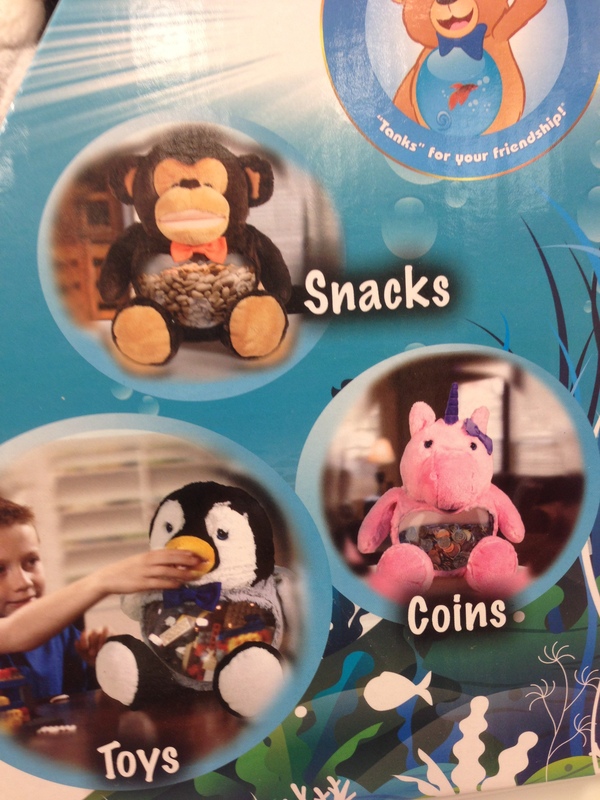 It can hold your pets or your snacks! What an amazing invention. It’s a very exciting time of year for makeup hoarders lovers of America. It’s Ulta’s 21 Days of Beauty Sale. For 21 glorious days, there are special flash sales on high-end products. Last Thursday, Butter London nail polish was reduced to a mere $9. I was in a panic all that day, worrying that my store (which is always out of everything) would run out before I got there. However, they had plenty of bottles left when I arrived. I bought Hardwear PD Quick Topcoat, which is way too long of a name for a topcoat. I really needed it because I used up my CND Speedy Topcoat on my glitter nails from last week. Hardwear usually retails for $19, so I got it for more than half off. Plus, it is 0.1 ounce larger than Speedy, which sells for $8.50. I also decided to buy a mate for my topcoat, a basecoat called Nail Foundation Flawless Basecoat. I honestly wasn’t expecting much because I sometimes feel like topcoats are like shampoo. You can find one that you really love, but one day it just stops working for you. However, I am really loving this combo. 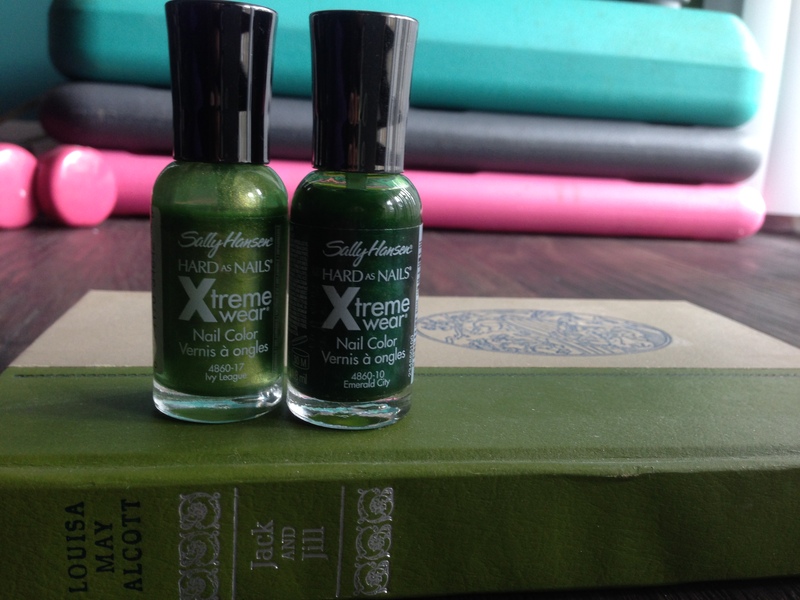 After my Piccadilly Green manicure flaked off, I painted my nails with cheap $3 Sally Hansen Xtreme Wear polish in Ivy League. This color is shimmery and semi-sheer. 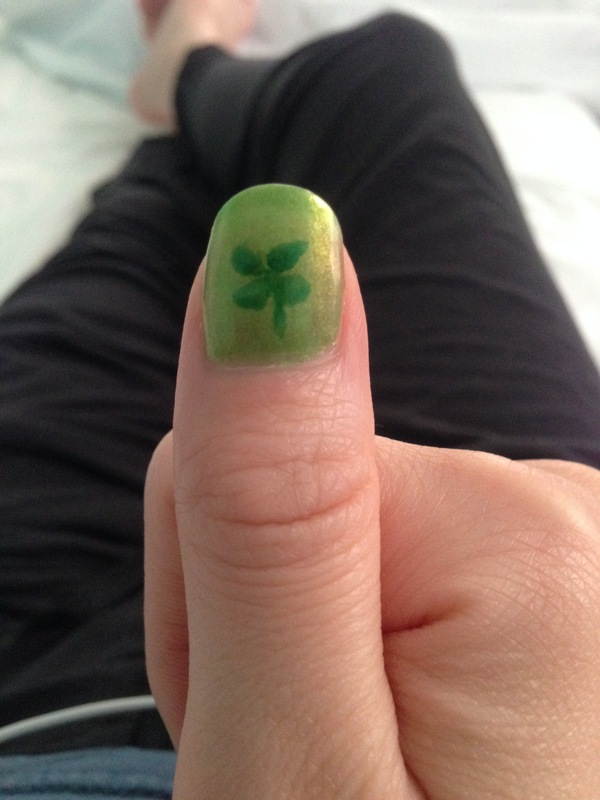 I then painted four-leaf clovers on my thumbs in Emerald City. Making a four-leaf clover isn’t that hard. 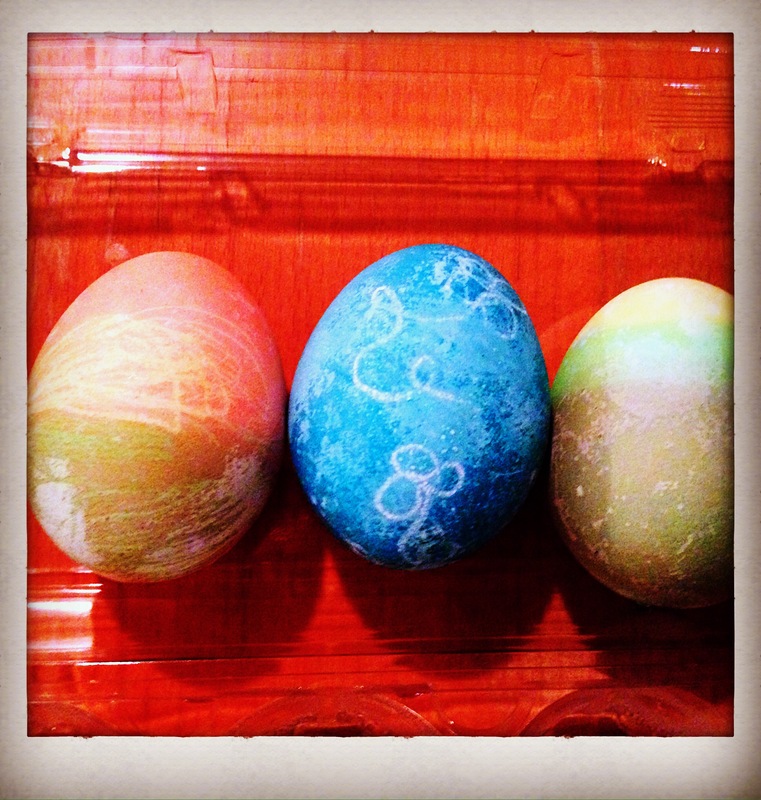 First, make sure that you have a minimal amount of paint on your brush. 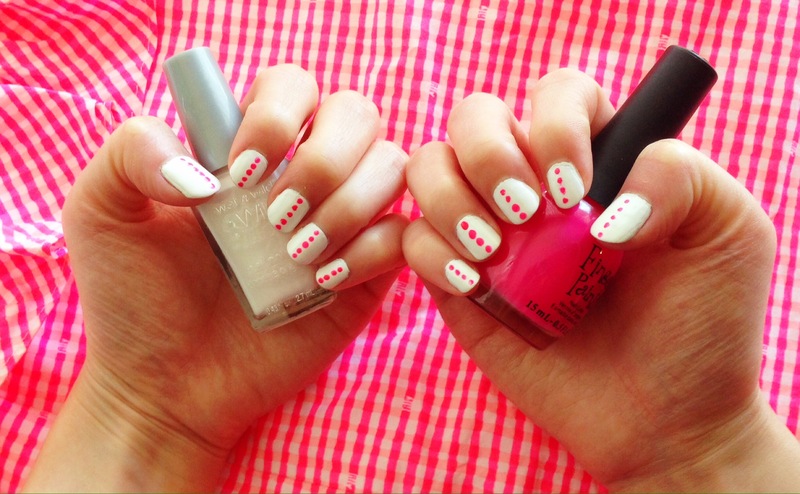 Then make four dots in a circle on your nail. Try to make the dots kind of uneven to make the leaves look more realistic like my first attempt. Jono’s attempt at being artsy at the mall. The lighting is too icky for good pics there. My left thumb was my first attempt. I made the dots too round and close together. It looks like a schoolkid painted it for art class. The right thumb’s dots are spaced farther apart and are more free-form. This makes the clover look more natural. My new topcoat and basecoat have really made this manicure last. This Sally Hansen nail polish usually only lasts a couple days on me. I didn’t notice any chipping until after I cleaned the bathroom today, which is day four. Four days is double my usual wear time for these greens. So far I give Butter London two green thumbs-up. Mani Monday: $20 Nail Polish??? Would you pay $20 for nail polish? 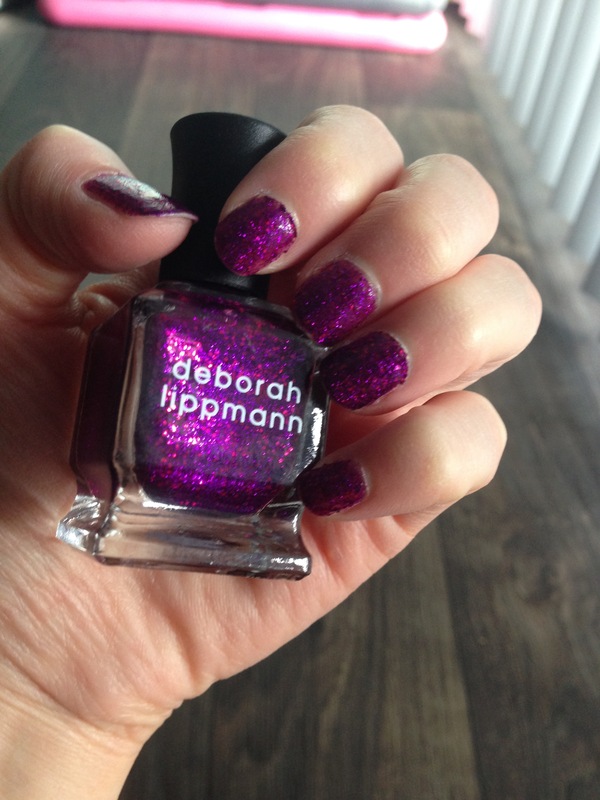 That’s how much Deborah Lippmann glitter nail polish costs. Do you want to know what makes this bottle of nail polish so special? It’s special because the formula won’t even last a full 24 hours. Isn’t that terrible? If a nail polish costs $20, it should at least last a full day’s worth of wear (and maybe wash your dishes for you). Flash Dance has a lumpy formula and a matte finish. It took three coats of topcoat to make it shiny enough to appreciate the different tones of glitter. 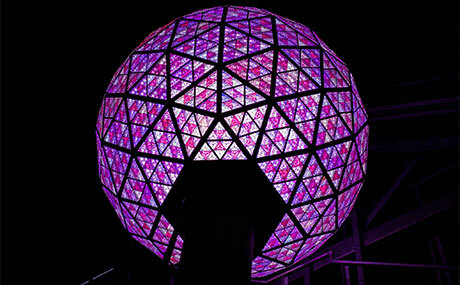 This is disappointing because I really was excited for my hands to look like the 2015 New Year’s ball. 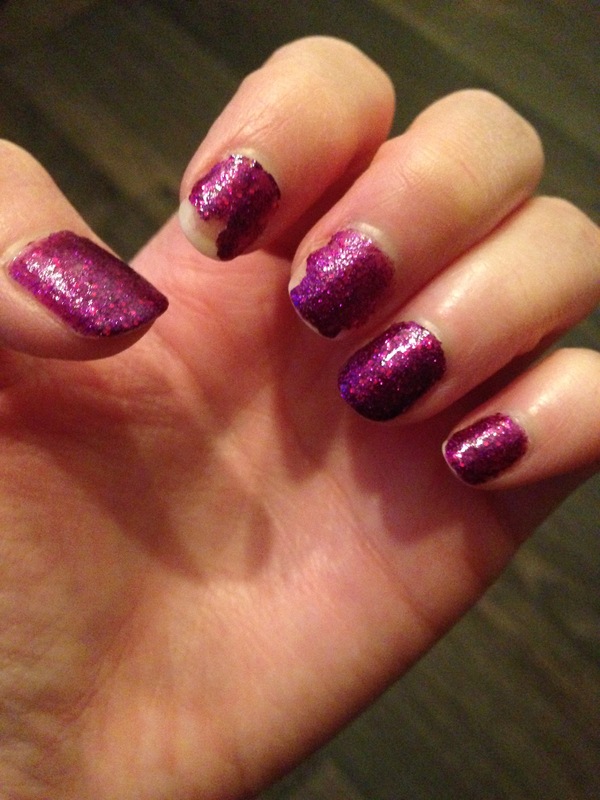 Have you ever had a mani as bad as this one? Let me know in the comments!